Application:It is widely used in refractory materials, powder plant, metallurgy, chemical industry, energy, transportation, heating and other industries. Raw Materials:Magnesium powder, iron powder, manganese powder, bauxite, graphite powder, clay, limestone, ilmenite concentrate powder, titanium powder, manganese powder, silicon manganese alloy, etc. 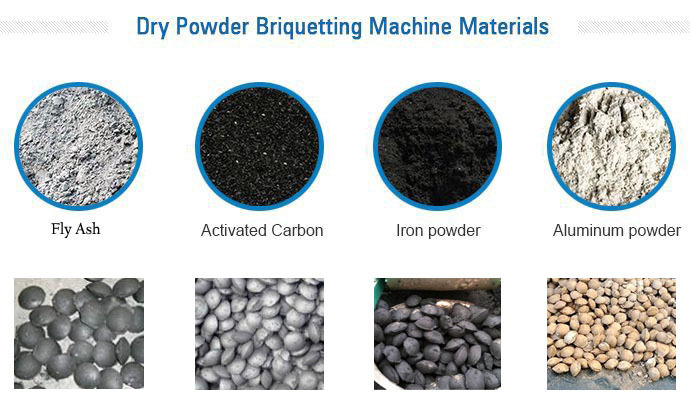 Dry powder briquetting machine has extensive practical applications, which can press powder materials without moisture into balls, such as lime, cryolite, aluminum oxide, chemical fertilizer, metal magnesium, bauxite, aluminum ash, etc. Its purpose is to reduce dust pollution, control capacity, recycle waste and make the transportation convenient. Dry powder briquetting machine is suitable for the cold pressing of magnesium powder, iron powder, manganese powder, activated carbon, bauxite, caustic soda, graphite powder, clay, cryolite, fertilizers, plastics, limestone, pigment, potassium salt, ilmenite concentrate powder, titanium powder, manganese powder, silicon manganese alloy, aluminum, aluminum powder, dolomite, calcium carbide, sludge, dust, oxide, copper powder, zinc powder, flux, soil vanadium ore and various industrial powder, waste powder, stainless steel, non-ferrous metal powder, metallurgy powder and so on. The pressed briquettes can be directly used in metallurgy, coal, building materials, chemical industry, electric power, refractory and other industries. 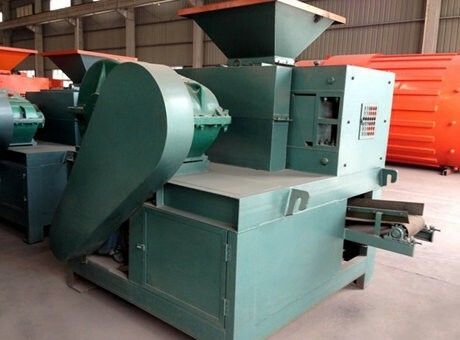 Dry powder briquetting machine produced by Fote Machinery transfers power to the two rollers through the speed reducer and the two pressure rollers will rotate in opposite directions. When the two rollers are rotating, materials will move into the ball mold on rollers. 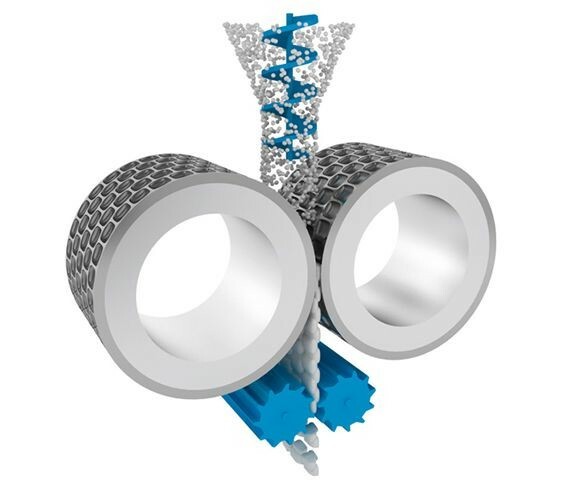 With the rotation of rollers, the small pressure of materials will become big. When the material is moving to the line contact point of rollers, the pressure has reached the peak. With the huge line pressure, the powder materials will be pressed into finished balls. 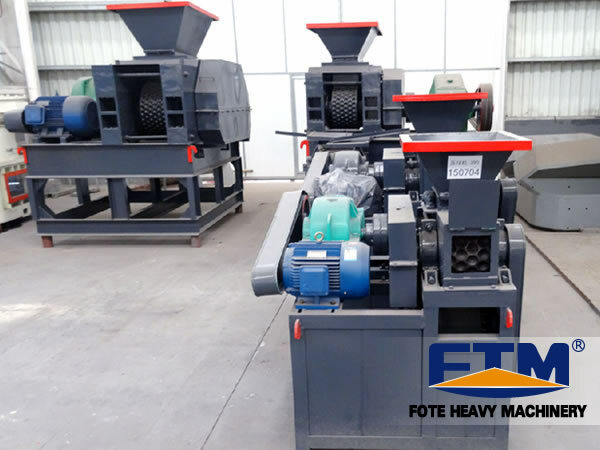 Fote Machinery has dry powder briquetting machine for sale, which has high working efficiency, favorable price and complete types, such as quicklime dry powder briquetting machine. If you want to know more about dry powder briquetting machines, please chat with us online or leave us a message. We are ready to help you!